This protocol describes the preparation of elemental lanthanides under inert atmosphere and their application in a selective C-F activation process involving trifluoromethylated benzofulvenes. Kumar, T., Ben Hassine, A., Martinez, A., Harakat, D., Chevreux, S., Massicot, F., Taillefer, M., Behr, J. B., Vasse, J. L., Jaroschik, F. Application of Elemental Lanthanides in the Selective C-F Activation of Trifluoromethylated Benzofulvenes Providing Access to Various Difluoroalkenes. J. Vis. Exp. (137), e57948, doi:10.3791/57948 (2018). The selective activation of one carbon-fluorine bond in polyfluorinated aromatic molecules or in trifluoromethyl-containing substrates offers the possibility of accessing unique fluorine-containing molecules, which are difficult to obtain by other synthetic pathways. Among various metals, which can undergo C-F activation, lanthanides (Ln) are good candidates as they form strong Ln-F bonds. Lanthanide metals are strong reducing agents with a redox potential Ln3+/Ln of approximately -2.3 V, which is comparable to the value of the Mg2+/Mg redox couple. In addition, lanthanide metals display a promising functional group tolerance and their reactivity can vary along the lanthanide series, making them suitable reagents for fine-tuning reaction conditions in organic and organometallic transformations. However, due to their oxophilicity, lanthanides react readily with oxygen and water and therefore require special conditions for storage, handling, preparation, and activation. These factors have limited a more widespread use in organic synthesis. We herein present how dysprosium metal - and by analogy all lanthanide metals - can be freshly prepared under anhydrous conditions using glovebox and Schlenk techniques. The freshly filed metal, in combination with aluminum chloride, initiates the selective C-F activation in trifluoromethylated benzofulvenes. The resulting reaction intermediates react with nitroalkenes to obtain a new family of difluoroalkenes. Lanthanide metals have been sporadically used in organic synthesis since the late 1970s1. Initially, these strong reducing agents, with a redox potential Ln3+/Ln of approximately -2.3 V, were employed mainly in Birch-type reductions of aromatic compounds and pinacol coupling reactions. An increased availability and purity of lanthanide metals from the 1980s on, as well as the development of methodologies and equipment to handle air and moisture sensitive compounds led to new applications of lanthanide metals. The preparation of the widely used SmI2 directly from Sm metal and diiodoethane or iodine was a breakthrough in lanthanide chemistry2. In recent years, new reactivity patterns of lanthanide metals have been described, for example, the Barbier-type reaction of allylic halides with carbonyl compounds3, the reductive coupling reactions involving diaryl ketones4 or acyl chlorides5, selective cyclopropanation reactions6, and the combination of lanthanide metals with group 4 metallocenes7,8. These studies showed that lanthanide metals display a promising functional group tolerance and that their reactivity can vary along the lanthanide series, making them suitable reagents for fine-tuning reaction conditions in organic transformations. Organolanthanide complexes and inorganic lanthanide salts have been studied in C-F activation reactions with aromatic and aliphatic carbon-fluorine bonds for over 40 years9,10,11. In 2014, the first report on C-F activation using elemental ytterbium metal appeared12. It showed the regioselective reaction of Yb with pentafluorobenzene to afford p-tetrafluorobenzene and YbF2. More recently, we have shown that various lanthanide metals can react with trifluoromethylated benzofulvenes in the presence of aluminum chloride to obtain ε,ε-difluoropentadienylmetal complexes that reacted selectively with a wide range of aldehydes to new difluoroalkenes (Figure 1)13. It turned out that the combination of dysprosium metal and aluminum chloride gave the highest yields and best selectivities. We herein present an extension of this work using nitroalkenes as electrophiles14, leading regioselectively to a new class of difluoroalkenes15. Prepare necessary equipment: oven-dried Schlenk tube with a magnetic stir bar, vacuum/inert gas line (argon or nitrogen), and magnetic stirrer. Prepare trifluoromethylated benzofulvene according to the literature13. Weigh out trifluoromethylated benzofulvene (177 mg, 0.65 mmol) and add into an oven-dried Schlenk tube equipped with a magnetic stir bar. Close the Schlenk tube with a plastic screw cap with PTFE liner and connect to vacuum line. Start stirring and apply vacuum to dry benzofulvene for 10 min. Then, release the vacuum with argon/nitrogen and again apply the vacuum. Repeat this process 3 times. Finally, fill the Schlenk tube with argon/nitrogen and close it tightly. Take the Schlenk tube under argon/nitrogen to the glove box. Prepare necessary equipment: glove box under argon/nitrogen with weighing balance, metal file, pliers, aluminum foil, forceps, spatula, test tube, and 2 rubber septa. Insert Schlenk tube with benzofulvene, a test tube and 2 rubber septa into the glovebox according to your group's general practice for handling the glovebox, e.g., for a small chamber apply vacuum for 1 min then release with argon/nitrogen three times. Put one piece of aluminum foil onto the weighing balance and one onto a plate on the glovebox floor for filing. Tightly hold the dysprosium metal with the help of pliers and remove its upper inactive layer by filing with a metal file to obtain a shiny metal surface. Discard this filed metal. NOTE: (1) Use large metal pieces for filing and avoid contact between the pliers and the file in order not to contaminate the dysprosium metal with other metals. (2) Use a different metal file for each lanthanide metal to avoid cross-contamination. (3) Discarded metal powder should be quenched separately outside the glove box, using dil. aq. HCl solution. Caution: The reaction of dysprosium with aq. HCl is exothermic and produces hydrogen gas, therefore quench the dysprosium in an open flask surrounded by ice bath. Prepare freshly filed dysprosium metal (82 mg, 0.50 mmol), add to the Schlenk tube, and close the tube with a rubber septum. Weigh anhydrous AlCl3 (200 mg, 1.5 mmol) into a test tube and close the tube with a rubber septum. Remove the Schlenk tube and the test tube from the glove box. Prepare necessary equipment: vacuum/inert gas line (argon or nitrogen), magnetic stirrer, and dry 2 mL syringe with needle. Prepare chemicals: freshly distilled dry THF and iodine. Clamp the Schlenk tube in a fume hood above a magnetic stirrer and connect to the vacuum line. Perform three cycles of vacuum/inert gas before opening the Schlenk tube under a positive flow of argon/nitrogen. Start the magnetic stirrer. Clamp the test tube with AlCl3 in a fume hood and connect to the inert gas line via a needle under a positive flow of argon/nitrogen. Add a catalytic amount of iodine (10 - 12 mg) to the Schlenk tube under a positive argon/nitrogen flow. Take 1.5 mL of freshly distilled dry THF using the purged syringe and add 0.5 mL to the Schlenk tube to obtain a deep brown solution (color of iodine in THF). Add the remaining 1.0 mL of THF dropwise to the test tube with AlCl3, which will lead to a slightly yellow solution. NOTE: Depending on the quality of AlCl3, the addition of THF can be more or less exothermic. While still warm, transfer this AlCl3 solution from the test tube to the Schlenk tube using the syringe. Allow the reaction to stir until the full consumption of benzofulvene. Initially, the deep brown color will disappear to give a yellow solution, which over time will turn to a dark green turbid solution. Check the reaction by thin-layer chromatography (TLC) after 1 h by taking a sample of the reaction mixture with a capillary under a positive flow of argon/nitrogen. Use petroleum ether as eluent. NOTE: The starting benzofulvene is bright yellow on the TLC plate and its disappearance can be readily observed. Prepare 4-methoxyphenylnitroalkene according to the literature16. In a test tube weigh out 4-methoxyphenylnitroalkene (90 mg, 0.50 mmol), close the tube with a rubber stopper, and dry it on the vacuum line via a needle connection. After disappearance of benzofulvene in the reaction mixture (confirmed by TLC analysis), add dry nitroalkene to the Schlenk tube under a positive flow of argon/nitrogen. The reaction mixture will change color to yellow-green. Monitor the reaction by TLC analysis, until full consumption of nitroalkene (usually 1 hour). Use petroleum ether/ethyl acetate 95/5 as eluent. Dilute the reaction mixture with 20 mL of diethyl ether and quench it with 5 mL of 1 molar aqueous solution of hydrochloric acid in an open Schlenk tube. CAUTION: The reaction of remaining dysprosium with aq. HCl is exothermic and produces hydrogen gas, which may cause pressure build up in Schlenk. Therefore, quench the reaction in open Schlenk under a good fume hood. After quenching the reaction, transfer it to a separatory funnel. Collect the organic phase in a conical flask. Wash the aqueous phase 2 times with 10 mL of diethyl ether and collect the organic phase in the conical flask. Dry the organic phase over MgSO4, filter into a pre-weighed flask, and concentrate under reduced pressure on a rotary evaporator to get the crude product as an orange-brown oil. Purify the crude product by silica gel column chromatography starting with petroleum ether as eluent to remove non-polar hydrolyzed product. Increasing the polarity up to 10/1 petroleum ether/ethyl acetate gives the new nitro-containing difluoroalkenes. NOTE: When performing the column chromatography on a long column and by slowly increasing the polarity, it is possible to separate the diastereoisomers for analysis purposes. This lanthanide-mediated C-F activation procedure followed by reaction with nitroalkenes provides readily access to new difluoroalkenes containing a nitro group. A plausible reaction mechanism is depicted in Figure 2. In contrast to our previous work using aldehydes as electrophiles (Figure 1)13, nitroalkenes afford the 1,3-disubstituted indene products regioselectively. This may be explained by the greater steric bulk of the nitroalkene group. In order to find the best reaction conditions we investigated the combination of two different lanthanide metals (La, Dy) with AlCl3 in this reaction with nitroalkenes. It turned out that in both cases, the reaction proceeded with comparable regioselectivity and with the same poor diastereoselectivity. In the case of Dy, the yield was considerably higher than with La metal and we continued therefore our study with the Dy/AlCl3 system, as in our previous report with aldehydes13. Under optimal conditions, the crude 19F NMR spectrum of the new difluoroalkene products in CDCl3 shows two sets of two doublets, one at -82.9 ppm and -86.7 ppm (J = 27 Hz) and the other one at -82.9 ppm and -86.8 ppm (J = 27 Hz), corresponding to the difluoroalkene groups of the two diastereoisomeric products. As an excess of starting benzofulvene is used, one will also observe another set of two doublets at -83.5 and -87.7 ppm (J = 28.2 Hz) corresponding to the hydrolyzed product, in variable yield (Figure 3). In case moisture entered the reaction, e.g.,from starting materials or during the solvent/reagent transfers, or if the second step did not go to completion, the set of signals for the hydrolyzed product would increase. If the first step of the reaction did not go to completion, e.g., if the lanthanide metal was not reactive enough, some starting benzofulvene may still be observed at -56.3 ppm (Figure 3). 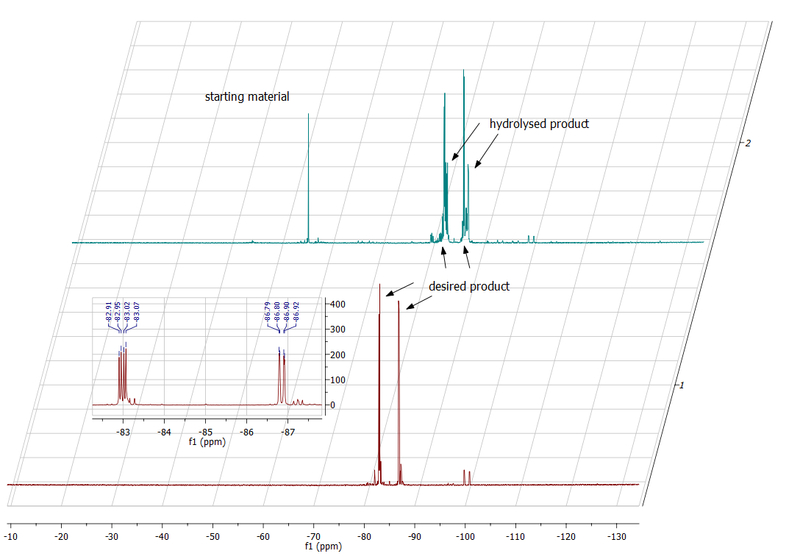 1H and 13C NMR spectroscopic analyses were in agreement with this description (Figure 4). Analysis of the infrared spectrum of the final product also nicely shows the incorporation of the nitro group (1553 and 1375 cm-1) and the transformation of the CF3 group into the CF2 alkene (1707 cm-1). Analysis by high-resolution electron-impact mass spectrometry further confirmed the identity of the product, showing the parent ion at m/z = 433.1479 (calculated 433.1489). This reaction works smoothly with a range of 2-arylnitroalkenes leading to the corresponding difluoroalkenes as 1:1 mixtures of diastereoisomers in good yields (Figure 5, Table 1). The aryl groups can contain an electron-donating group (-OMe) or electron-withdrawing groups (-Cl, Br) in the para-position. The reaction also proceeds with phenyl- or 1-naphthyl-containing nitroalkenes. We have previously shown that benzofulvenes substituted with aryl groups other than phenyl on the exocyclic carbon also afford a C-F activation reaction13. Here we include another example of 2-thienyl-substituted benzofulvene, which after C-F activation and reaction with p-Cl-phenylnitroalkene yields the corresponding difluoroalkene (entry 6). It should be noted that with the electron-rich p-dimethylaminophenyl group on the benzofulvene, no reaction occurs under these conditions13. Figure 1: Lanthanide-mediated C-F activation in trifluoromethylated benzofulvenes. Please click here to view a larger version of this figure. Figure 2: Plausible reaction mechanism for the formation of nitro-group containing difluoroalkenes via C-F activation. Please click here to view a larger version of this figure. 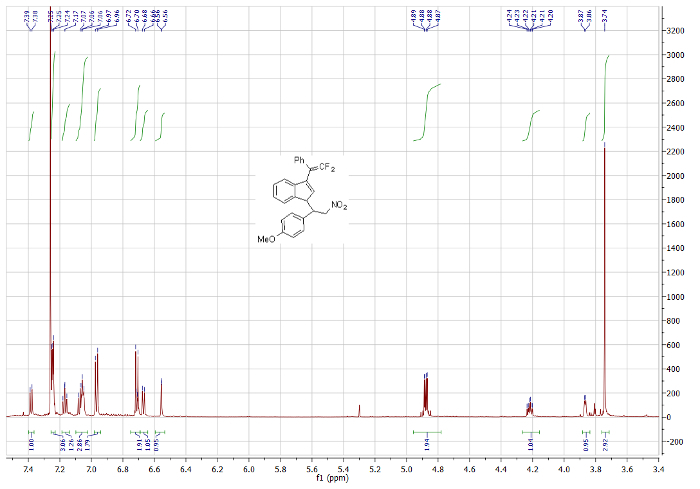 Figure 3: Comparison of crude 19F NMR spectra of two different reactions. Below, red: reaction worked well (insert shows the mixture of two diastereoisomers in a 1:1 ratio). Above, blue: reaction did not work well, with considerable amounts of starting benzofulvene and hydrolysed product present. Please click here to view a larger version of this figure. 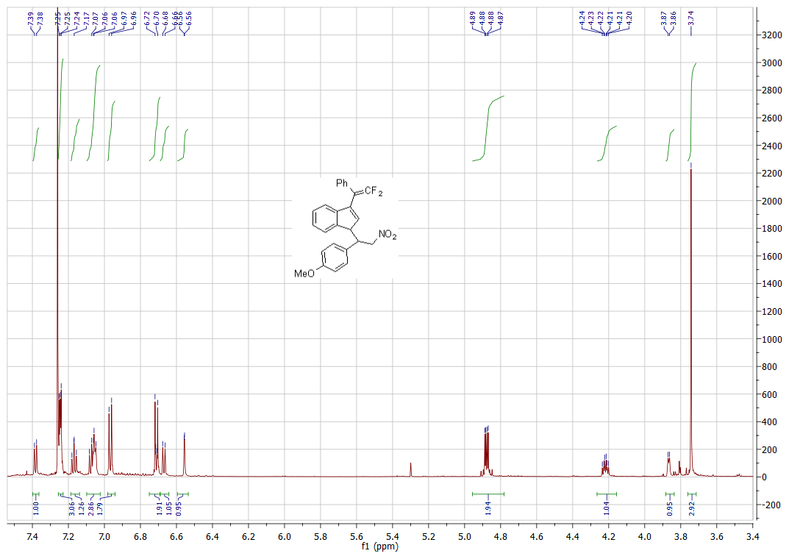 Figure 4: 1H NMR spectrum (600 MHz, CDCl3) of one diastereoisomer of nitro-containing difluoroalkene. Please click here to view a larger version of this figure. Figure 5: Scope of reaction with various 2-arylnitroalkenes Please click here to view a larger version of this figure. This protocol involves work with highly reactive, air and moisture sensitive lanthanide metals. Therefore, the whole reaction procedure must be carried out under dry inert gas, and all starting materials, including solvents, must be very clean and dried before use. There are two advantages for the preparation of freshly filed metals over the purchase of already filed metals: (i) the purchase of pieces or ingots is considerably more economic and (ii) freshly filed metal is more reactive because of less surface passivation caused by the storage of the filed metal. The described procedure has two main critical steps: (i) the preparation of the lanthanide metal by filing a shiny piece of metal and (ii) the initiation of the C-F activation process by adding a small amount of iodine and carrying out the reaction with small volumes of THF solvent. The advantage of this reaction is that it involves two characteristic color changes, which will directly indicate whether the reaction is performing well or not and where to start looking for modifications. The first one is the disappearance of the deep brown iodine color, leading slowly to a dark-green turbid solution at the end of the C-F activation process. The second is the change to yellow-green after addition of the nitroalkene. If these color changes do not occur, there may be a problem with the starting materials or the solvent. It is important to note, that this procedure describes how the reaction can be performed in "dry" gloveboxes, i.e., in which the use of solvents is not allowed. A possible modification for "wet" gloveboxes is to carry out the solvent addition steps in the glovebox, thereby avoiding possible contaminations with air or moisture during the transfer of the AlCl3-THF solution. Among the drawbacks of working with elemental lanthanides, is the fact that reactions often only work in ethereal solvents, mainly THF. Other solvents could be interesting with respect to variation of selectivity outcomes. In addition, one should use the freshly filed metal rapidly in order to avoid passivation by reaction with traces of air, moisture or certain solvents/chemicals present in the glovebox. The described C-F activation process is the first one concerning CF3 groups attached to diene systems, leading to unprecedented difluoroalkene systems. It opens up many possible extensions with respect to substrates and electrophiles. So far, it has been successful with CF3 groups on benzofulvenes, and work is currently in progress to extend this procedure to other CF3 containing substrates. We acknowledge financial support from ANR (ANR-15-CE29-0020-01, ACTIV-CF-LAN), CNRS, ICMR, Université de Reims Champagne Ardenne, ENSCM and ICGM. We thank Carine Machado and Anthony Robert for help with EI-MS and NMR analysis. Molander, G. A. Application of Lanthanide Reagents in Organic Synthesis. Chem. Rev. 92, (1), 29-68 (1992). Girard, P., Namy, J. L., Kagan, H. B. Divalent Lanthanide Derivatives in Organic Synthesis. 1. Mild Preparation of SmI2 and YbI2 and Their Use as Reducing or Coupling Agents. J. Am. Chem. Soc. 102, (8), 2693-2698 (1980). Wu, S., Li, Y., Zhang, S. α-Regioselective Barbier Reaction of Carbonyl Compounds and Allyl Halides Mediated by Praseodymium. J. Org. Chem. 81, (17), 8070-8076 (2016). Umeda, R., Ninomiya, M., Nishino, T., Kishida, M., Toiya, S., Saito, T., Nishiyama, Y., Sonoda, N. A Novel Lanthanum Metal-assisted Reaction of Diaryl Ketones and Electrophiles. Tetrahedron. 71, (8), 1287-1291 (2015). Chen, W., Li, K., Hu, Z., Wang, L., Lai, G., Li, Z. Utility of Dysprosium as a Reductant in Coupling Reactions of Acyl Chlorides: The Synthesis of Amides and Diaryl-Substituted Acetylenes. Organometallics. 30, (7), 2026-2030 (2011). Concellón, J. M., Rodríguez-Solla, H., Concellón, C., del Amo, V. Stereospecific and Highly Stereoselective Cyclopropanation Reactions Promoted by Samarium. Chem. Soc. Rev. 39, (11), 4103-4113 (2010). Bousrez, G., Dechamps, I., Vasse, J. -L., Jaroschik, F. Reduction of Titanocene Dichloride with Dysprosium: Access to a Stable Titanocene(II) Equivalent for Phosphite-free Takeda Carbonyl Olefination. Dalton. Trans. 44, (20), 9359-9362 (2015). Bousrez, G., Jaroschik, F., Martinez, A., Harakat, D., Nicolas, E., Le Goff, X. F., Szymoniak, J. Reactivity Differences Between 2,4- and 2,5-Disubstituted Zirconacyclopentadienes: A Highly Selective and General Approach to 2,4-Disubstituted Phospholes. Dalton. Trans. 42, (30), 10997-11004 (2013). Klahn, M., Rosenthal, U. An Update on Recent Stoichiometric and Catalytic C-F Bond Cleavage Reactions by Lanthanide and Group 4 Transition-Metal Complexes. Organometallics. 31, (4), 1235-1244 (2012). Deacon, G. B., Junk, P. C., Kelly, R. P., Wang, J. Exploring the Effect of the Ln(III)/Ln(II) Redox Potential on C-F Activation and on Oxidation of Some Lanthanoid Organoamides. Dalton Trans. 45, (4), 1422-1435 (2016). Träff, A. M., Janjetovic, M., Ta, L., Hilmersson, G. Selective C-F Bond Activation: Substitution of Unactivated Alkyl Fluorides using YbI3. Angew. Chem. Int. Ed. 52, (46), 12073-12076 (2013). Deacon, G. B., Jaroschik, F., Junk, P. C., Kelly, R. P. A Divalent Heteroleptic Lanthanoid Fluoride Complex Stabilised by the Tetraphenylcyclopentadienyl Ligand, Arising From C-F Activation of Pentafluorobenzene. Chem. Commun. 50, (73), 10655-10657 (2014). Kumar, T., Massicot, F., Harakat, D., Chevreux, S., Martinez, A., Bordolinska, K., Preethanuj, P., Kokkuvayil Vasu, R., Behr, J. -B., Vasse, J. -L., Jaroschik, F. Generation of ε,ε-Difluorinated Metal-Pentadienyl Species through Lanthanide-Mediated C-F Activation. Chem. Eur. J. 23, (65), 16460-16465 (2017). Philips, F., Maria, A. Organocatalytic Asymmetric Nitro-Michael Reactions. Curr. Org. Synth. 13, (5), 687-725 (2016). Zhang, X., Cao, S. Recent Advances in the Synthesis and CF Functionalization of Gem-difluoroalkenes. Tetrahedron Lett. 58, (5), 375-392 (2017). Kodukulla, R. P. K., Trivedi, G. K., Vora, J. D., Mathur, H. H. Synthesis, Chemical Transformation and Antimicrobial Activity of a Novel Class of Nitroolefins: 1,3-Diaryl-2-nitroprop-1-enes. Synth. Commun. 24, (6), 819-832 (1994).